The First Northern Thailand Toastmasters’ Club held its annual dinner and election of the new committee recently at the Shangri La Hotel. After his election as the new president for 2008-2009, Somchai Nirachornkul stated that his prime target would be to promote understanding about the club to both young and older people who wish to improve their public speaking skills, and that his secondary target would be to encourage at least 10 new members to join the club and benefit from its extensive programme. The Chiang Mai branch of Toastmasters International was started by the past president, Umpiga Boonyasing, who, after returning to Thailand after 20 years living in Manchester, UK, had decided she needed a venue to maintain and improve her English-speaking skills. After some research, she discovered Toastmasters International, whose nearest club was located in Bangkok. Undeterred, she founded in July 2006 the First Northern Thai Toastmasters’ Club right here in Chiang Mai! The aim of the club is to offer Chiang Mai residents the opportunity to benefit from the organisation’s world –class education programme and to provide effective training and leadership development opportunities for its members. Toastmasters International is a non-profit organization with the mission to provide a mutually supportive and positive learning environment in which every member has the opportunity to develop communication and leadership skills which in turn foster self-confidence and personal growth. Through its club members the club mission also helps men and women learn the arts of speaking, listening and thinking-vital skills that promote self-actualisation, enhance leadership potential and foster understanding, thus helping both men and women develop into confident and eloquent speakers. A recent interview with the Chiang Mai Mail’s reporter granted by the former Director of the Tourist Authority of Thailand’s Northern Office, Junnapong Saranak, provided some interesting insights on the tourist situation here in Chiang Mai. Junnapong held the directorship for the full four years, and had always considered that Chiang Mai was the dream destination, both for tourists and for himself. His extensive previous experience included positions as assistant director of TAT Japan, TAT Tak and TAT Chiang Mai, followed by his directorships of TAT Tak and TAT Taipei. Junnapong considers that his term in office has resulted in many achievements and good memories, as all four provinces for which he held responsibility, (Chiang Mai, Lamphun, Lampang and Mae Hong Son), contained major attractions on Thailand’s tourist trail. He considered his proudest achievement, however, to be the Royal Flora Exposition for His Majesty the King, Rachaphruek 2006, and said that all Thais and particularly residents of Chiang Mai, should share this pride. During the exhibition, he stated, at least 6 million visitors arrived in the city to celebrate the glory of His Majesty the King by visiting the spectacular display. A welcome result was the massive financial stimulus to the local tourist industry. Junnapong is proud to have worked closely with both government and private sectors in order to make the huge event possible. As regards promotion of the Northern area internationally during Junnapong’s directorship, Chiang Mai’s TAT office has participated in a number of overseas travel fairs and organised many roadshows in order to open up more varied distribution channels in targeted market areas, This has allowed local SME’s to promote their products such as accommodation and tours, more efficiently, and led to improved marketing of the city as a prime tourist destination. Junnapong’s biggest disappointments centered around the misunderstanding of some of TAT’s strictly followed policies by sectors who may not have appreciated the procedures by which all of its activities were focused on benefiting tourism in the area. Negative criticism has been expressed, particularly on the internet, without TAT being given a chance to reply and present the facts. Most such online comments were anonymous, some were cruel, and tarnished TAT’s reputation as a whole. Junnapong stated that he and his organisation had found this very discouraging. When asked what he had liked most about his tenure as director, Junnapong replied that he had much appreciated the strong support given by the government to the tourist industry and their appreciation of its contribution to the country’s economic stability. He was also appreciative of the support given to his organisation by agents and the media in publicising its projects. In terms of personal experience, the opportunity to travel gave Junnapong a great deal of pleasure, In return for hard work, he said, he had been able to enjoy his travels to many interesting destinations to promote Chiang Mai and its surrounding areas. However, he had regrets that the demands of his job had meant that he often had to sacrifice time spent with his family, saying that it had made him a “bad family guy!” Another regret was that he had formed many plans for improving tourism in Chiang Mai which had been shelved due to limited budgets and lack of human capital; he stated that these obstacles had stagnated the progress of improvement for a long time. As regards the present situation, Junnapong considers that everything in the North can be used as a “pull factor” to attract new tourists to the city. Chiang Mai itself serves as a multiple destination hub as stated in the new TAT campaign entitled “The Seven wonders of Amazing Thailand”. The wonders consist of Thai-ness, Festivities, Natural Beauty, Wellness, Trends, Treasures and Beaches. Aside from the beaches, if the right products can be matched with their target markets, then the city should be able to respond to all visitor demands. Major problems do exist, he said, including supplier surplus during the low season, problems with certain tourist locations, bad management of certain attractions and a lack of cooperation between the various sectors. For example, the area used for Rachaphruek 2006 was not well supported as a permanent attraction, and could be better used as a venue for other visitor events. Junnapong pointed out that, for a number of years, tourism in the city and country was booming, particularly during the “Visit Thailand Year” promotion. Given the present unfavourable economic and political circumstances and the rapid increase in fuel prices, long-haul tourism could well be affected. As regards domestic tourism, 80% of visitors travel by car, mostly from Bangkok; this market also could decline as visitors decide to vacation somewhere nearer to home. Package holidays may also be affected as travel agents are being forced to increase their prices due to, for example, escalating airline fuel surcharges. Lastly, Jannapong, when asked what advice he would give to his successor, said that he didn’t think advice was necessary as the new director, Chalermsak Suranun, is Chiang Mai born and bred and has already created strong connections with both local and other sectors of the tourism industry. The Chiang Mai Mail, and particularly its managing editor, Phitsanu Thepthong, wishes Junnapong all success in his new position with TAT Hong Kong and thanks him for the interview. Members of the Chiang Mai Friends Group at their recent July meeting. 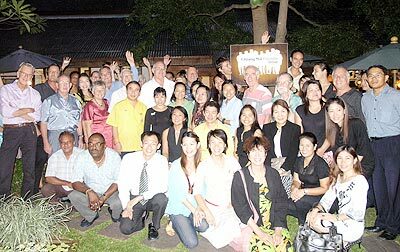 The Chiang Mai Friends Group held their July meeting recently at the Suan Pak Restaurant on Sanambin Road, between Airport Plaza and Immigration. Over 60 people attended; most arriving at 5.30pm in order to share in a tasty buffet (very good value at 220 baht per head), which gave everyone a chance to network and meet friends both old and new. On the agenda was the ‘Mayoral Community Garden Project’; the planting of herbal plants, trees and indigenous flowers in Chiang Mai City Centre. After a lively discussion, people were asked to write their comments and suggestions and give them to Boong to be passed on to the Mayor. Information was given about the bowling tournament which is being arranged by the Mayor in order to promote and raise money for HM the King’s Foundation. The major part of the meeting was taken up by Prasert Tanprasert, (Dang), with his 45 minute talk on ‘How Thais look at Farangs’, which proved both interesting and amusing. Dang, an architect, has made a point of learning and applying the ‘farang way’ to his own skills, by making sure that he works to the best of his ability and by not taking on tasks he is not skilled enough to complete satisfactorily! Questions from the foreigners in the audience proved interesting as many wanted to know what Thais dislike about farangs. As a result, in a friendly atmosphere, Thais in the audience helped the expats present to understand the Thai point of view and lifestyle. At the end of the meeting, everyone present agreed whole-heartedly that it had been most enjoyable and exactly what is needed to aid integration between the two communities.